Background: Patients with biochemical recurrence following primary prostate cancer (PCa) treatment often relapse in the lymph nodes (LN). Both salvage lymph node dissection (sLND) or elective nodal radiotherapy (ENRT) are potential treatment options. Objective: To describe the anatomic patterns of nodal oligorecurrent PCa in relation to different surgical and radiotherapy templates. Design, setting and participants: Patients with a biochemical recurrence following primary PCa treatment were eligible for a F18-choline PET-CT. The number of lesions were counted per scan. Patients with up to 5 LN (N1 or M1a) were eligible for the current analysis. Outcome measurement and statistical analysis: All LN recurrences were mapped on a reference CT. 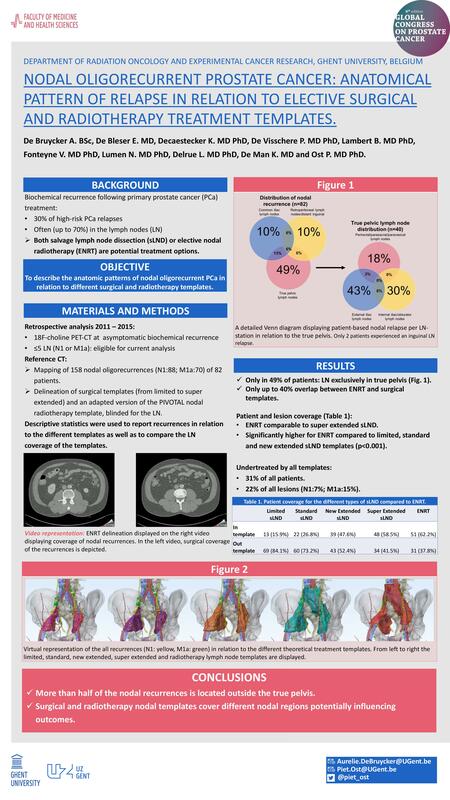 Different surgical templates (from limited to super extended) as well as the PIVOTAL nodal radiotherapy template (RTT) were contoured on the same reference CT, blinded for the recurrences. Descriptive statistics were used to report recurrences in relation to the different templates as well as to compare the LN coverage of the templates. Results and limitations:In total, 158 LN recurrences (N1:88;M1a:70) of 82 patients were mapped. Only in 49% of patients, the recurrences were exclusively located in the true pelvis. There is up to 40% overlap between RTT and surgical templates. ENRTsignificantly covers more patients and lesions as compared to all surgical templates (p<0.001), except for super extended sLND (p=0.607), ranging from 49% to 11% and 56% to 10% more coverage for the limited to super extended surgical templates, respectively. At least 31%of all patients would not be salvaged by any of the templates, missing 22% of all lesions (N1:7%,M1a:15%). Virtual representation and comparison are displayed in figure 1. Conclusions:Surgical and radiotherapy nodal templates cover different nodal regions potentially influencing outcomes, with the radiotherapy template theoretically covering more lymph node recurrences.